We are a BBB Accedited Coin Appraiser, Preferred by Banks, Courts and Trusts! We have a sell recommendation on coins! Coins are currently worth up to 3 x there value of just 6 years ago !! If you have inherited coins or have owned them for more than 6 years NOW IS THE TIME TO LOCK IN A PROFIT!! When this market corrects it could drop 50% or more in just weeks , like in the 1980 boom!! When Howard Markham was just a boy often he would tag along with his father to coin stores and coin shows and buy coins with the encouragement of his father. He developed a passion for coins and started his own collection. We are here for you! True experience and knowledge of the coin business does not come quickly. It is gathered over years spent seeing millions of coins, understanding how each mint and each year has different characteristics and features, and seeing counterfeits first hand. Howard began as a novice at 16, and his knowledge has grown with each passing year. Whether it be as a coin buyer for David Hall Rare Coins or as a coin grader for Professional Coin Grading Service, (PCGS,) Howard has always strived to increase his knowledge and passion for the trade. We bring this passion with us to every appraisal and with every customer. When you are looking to sell your coins and other fine possessions you must trust who you are dealing with and their unsurpassed knowledge. We have consulted for large corporations, auction companies and major collectors. Markham Numismatic has earned that trust and respect in the industry. Avoid Coin shops that buy baseball cards, jewelry, watches oh ya and coins! as the typically possess only General Knowledge . Some will evaluate your coins based on scrap value, which is the least an item could be worth. This is where the many years of experience and Specialized knowledge of Markham Numismatic sets them apart from the norm and establishes them as the company to go to when you are in the market to sell your coins or currency. Markham Numismatics in Riverside has been in the business for over 30 years. 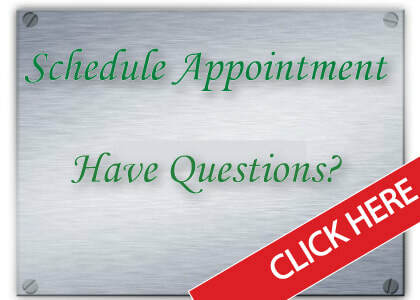 We operate by appointment only, which allows us to give customers the personal care and attention they deserve. 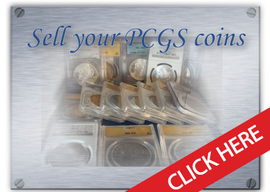 If you have coin collections, PCGS Coins or NGC Coins or old currency collections. you wish to sell, call for an appointment. Now is the best time to sell as prices are high! ALERT! the coin market is getting soft Sell Now to lock in Profits. !! Looking to sell your rare coins? sellers beware! Have you noticed all the random cash for gold dealers popping up everywhere? They have popped up everywhere in the last few years. Beware, these dealers are staffed with inexperienced green horns! some were recently gardeners and plumbers, and possess no knowledge of rare coins and values. You would be astounded by how little most gold store employee's know. I've heard of some gold stores putting acid on coins to make sure they are real! that damages the coins and turns it into a piece of metal, taking away any extra coin value the coin might of had. Don't lt this be you. Nothing replaces years of experience and a keen eye for coin grading. Last month we paid a man $500 for one silver dollar! No gold buyer will offer you $500 just for one silver coin. These scarp gold buyers wouldn't know the difference between a $2 dollar coin and a $500 dollar coin. Let us find the treasures in your collection! 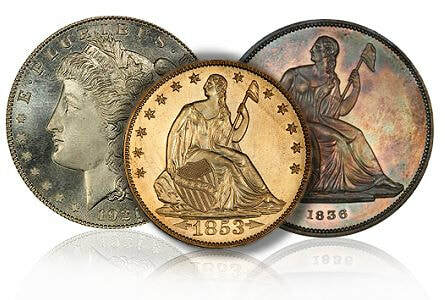 If you are looking to sell a coin collection, call 951-686-2122 to book an appointment today. ​We are Proud Supports of these charities. No valuables kept on premise, we use an institutional vault service.